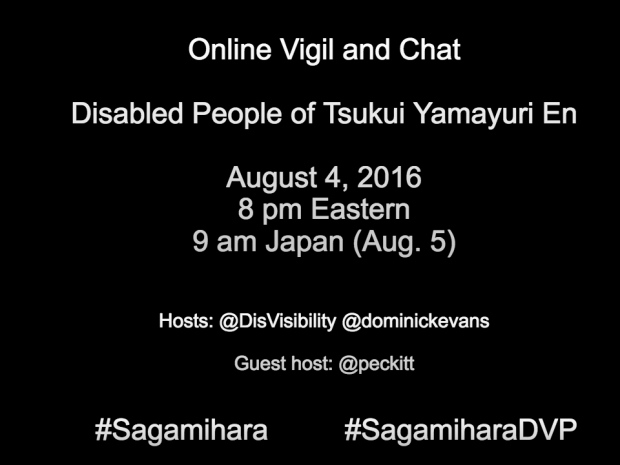 Tonight at 8 pm ET (which would be 9 am on Aug. 5 in Japan), Alice Wong of the Disability Visibility Project and disabled filmmaker/activst Dominick Evans will have an online vigil for those killed and the 20 wounded. The vigil and chat will include Dr. Gillan Peckitt who runs disability-related site The Limping Philospher and resides in Nada-Ku, Kobe, Hyogo Prefecture, Japan. You can learn more about the event at The Disability Visibility Project.